Craig Bay’s original owner, James Craig was born in Prince Edward Island in 1863. In 1882, he and his brother, Robert, worked and traveled their way across Canada. On the last leg of their journey in 1885, James estimated that he and his brother carried 40 pounds apiece on their backs and hiked 30 miles a day from Lytton to New Westminster. Then they took a side-wheeler steamer to Victoria and purchased a one ton canoe with plans to load it up with supplies and travel up island to farm. They headed to Campbell River but a storm wrecked their canoe in Comox and they drifted to French Creek, where they spent the winter. The next spring, they again met misfortune in a windy storm, and with a leaky boat, the two men drifted ashore just south of Englishman River. Regarding it as fate, James decided to settle near Englishman River. 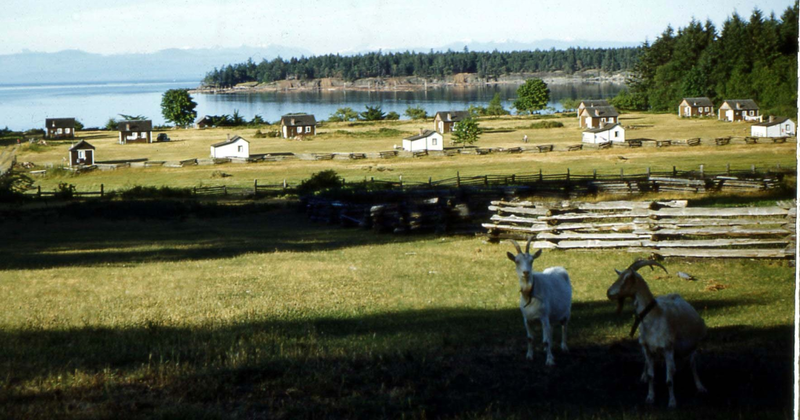 In 1887, James noticed a pretty cove nearby (Craig Bay) and staked out 160 acres to establish a homestead. An acre cost $1.00 at the time. James “Cougar” Craig earned a reputation as a renowned cougar hunter, using his “Louisiana Racoon Hounds” to track down cougars for residents in the area and to protect the sheep on neighbouring farms. 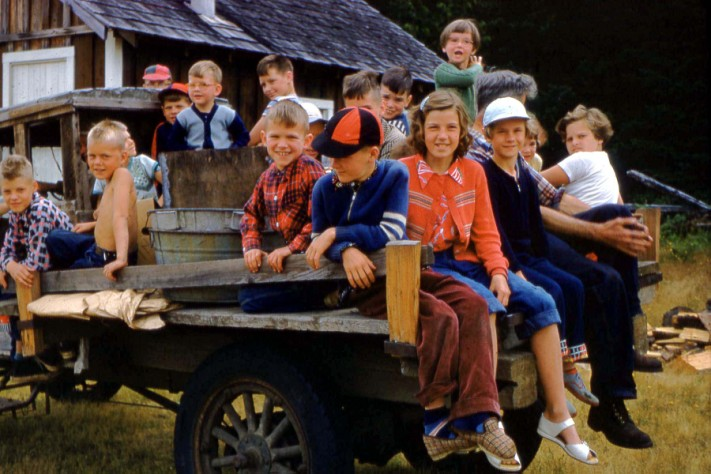 In 1889, Parksville had a population of 38 people and became an official settlement. In 1898, James married and had four children. A cabin was built for the engineer of the Canadian Pacific Railroad and rented out as Montrose School. When James’ wife Gertrude passed away in 1928, James and his two sons opened an auto camp on the property. They built 15 cabins as accommodations which became one of the first facilities for tourists in the area. James also ran sheep during the off season with his two sons. The photo above was taken from his son Fred’s farmhouse on the top of the hill. In 1946, James died at the age of 82 years. — Craig Heritage Park Museum and Archives (2008). http://www.parksvillemuseum.ca/Craig%20Family.htm (January 31, 2008) After James Craig passed away, his sons continued taking care of the land. The adjoining 16 acre parcel of land was owned by the Parkhursts and the Halls. Earle and Billie Parkhurst and their two children Nancy and Paul, bought the 16 acre parcel in 1951 with Dr. Hall’s family. I spoke with Paul Parkhurst in 2007 and he remembers what it was like here many years ago. He was approximately six years old at the time, and he remembers the campsite as being family oriented. The cabins did not have bathrooms or running water but were great if you didn’t have a tent to camp in. Beach Acres was the only resort along what now is called Resort Way. A restaurant named “Benny’s” was located on the Parkhurst/Hall property. As there was no kitchen at the restaurant, the family cooked for their patrons in Paul’s home and then took the meals up the dirt road to the restaurant. Paul remembers one afternoon, playing outside with his parents and grandmother, when one of James Craig’s sons, Fred, stomped up from the beach with a shotgun in his hands. Looking disheveled with dirty work clothes, teeth missing and hair sticking up, he said, “if I see your dog chasing my sheep again, you won’t have a dog.” After Paul’s father apologized, he promptly left. The next evening, Fred was back again, but Paul noticed he was “spiffed up,” with his hair slicked back, false teeth in and dressed in clean clothes. Curiously Paul watched as Fred asked to speak with his grandmother. After that, there were many times Fred and Paul’s grandmother would go for evening walks on the beach. Pictured here (to the right) is a pamphlet from Craig’s Campgrounds, a photo of the popular wagon rides in the early days and an aerial view of the campground area taken by Intrawest. 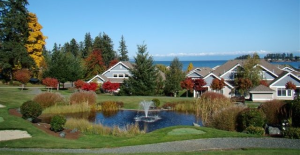 Intrawest was interested in developing the area and purchased the entire Craig property and also 8 acres from the Hall’s, where Arbutus Grove is now situated. There was talk of an 18 hole golf course and many other plans for the Heritage Lands but lucky for everyone here, the lands will remain a park. Our neighbour, Paul Parkhurst, still owns the remaining 8 acres situated beside Arbutus Grove where he lives with his wife, Catherine, their two sons, Willie and Louis and their nanny, Diana. I would like to thank Paul for giving us this glimpse into the past. Originally, the development plans for Craig Bay were quite different than we see today. Intrawest had intended to build three condominium units, the “Seawinds,” and the Beach Club with its amenities where the Heritage Lands now exist. After a sudden interest by the First Nations people as numerous bones and artifacts had been unearthed in the area and a lengthy court battle, the Provincial Government purchased the eleven acres of waterfront property and declared it a Heritage Park. 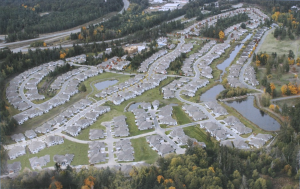 In March 1996, Shirley Biehl was the third person to purchase a home in the Shorehaven strata. The following is an account by Shirley in 2007 of the initial development of Craig Bay. “When we moved in, the area looked just as bare and new as some of Seaside Village looked a few years ago. The beautiful pond willows were mere sticks and Langara was a single street without curbs, boulevard or trees. The area where Arbutus Grove stands was a thick forest and Meadow Beach was a large natural grass area; a nesting site for Killdeer Plover and an area where the deer paraded across the meadow every afternoon. Before long, huge double trailer trucks deposited hundreds of water main and sewer pipes on Meadow Beach while logging trucks were busy clearing Arbutus Grove. We lived with the constant noise of logging trucks, bulldozers pushing out streets and clouds of dust. The constant hive of activities included the leveling and seeding of the Heritage parks. Among our early bird life were up to 500 Canada Geese and a pair of escaped Peacocks. The Peacocks produced one young peacock for two years in a row before they moved eastward to greener, less noisy pastures. Intracorp purchased a border collie name “Diane,” which was trained to herd geese. “Diane” remained a very valuable, although less seen, member of the community for sometime. A cougar made regular rounds through the area and was seen a number of times in different locations, such as on the bridge, by the Menzel House (now returned to its natural beginnings) and where the Beach Club now stands. When walking, we would regularly see his distinctive large paw prints. We could also hear the bugle of Elk and found their hoof prints up in the Cape Cod area. Beaver moved over the Craig Creek the following year. We obtained the fire pit the first summer. After observing on our walks the metal rings the neighbours to the east of us used, we decided we also needed a fire pit. A lot of hours were spent securing heavy logs with cables to protect it from winter storms and high tides. 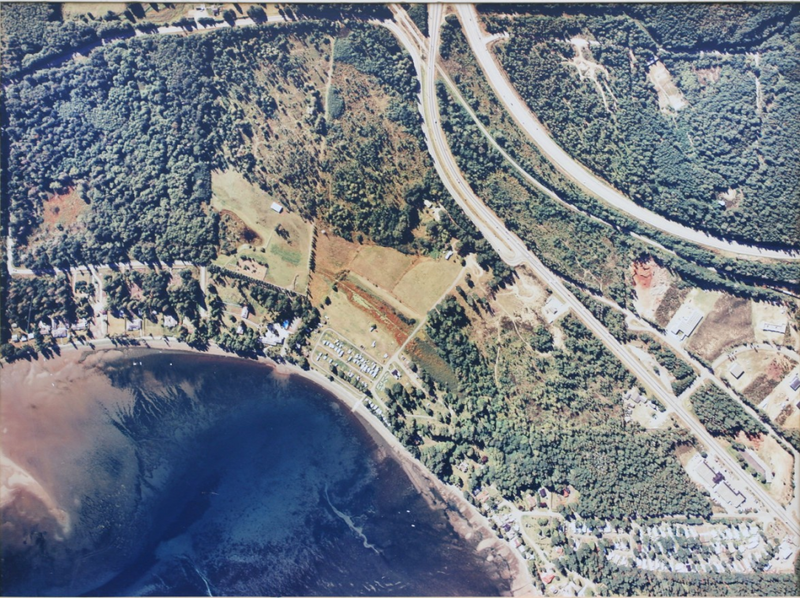 Pictured above is an aerial view of Craig Bay during the Onyx condo construction and left a photo during autumn. Craig Bay Estates has become a vibrant and active community of over 400 homes, with people from many parts of the world. It still retains its warm intimacy with its social life centered at the Beach Club. This article was researched and recorded by Charlene Jimmo.